SEOUL--(Korea Newswire) December 27, 2016 -- LG Electronics (LG) is showcasing its futuristic Levitating Portable Speaker (model PJ9) at CES 2017, the proving ground for exciting technology from across the electronics industry. The mesmerizing wireless speaker hovers in place over the accompanying Levitation Station to deliver high-quality audio while making quite an impression with its eye-catching design. In addition to its striking looks, the versatile speaker gives users the ability to seamlessly play music, podcasts and other audio content in the home as well as outdoors. The PJ9 creates its stunning visual effect using powerful electromagnets housed inside the Levitation Station to give the speaker its unique trait of being untouched by any surface or wires when playing. At the core is a 360-degree omnidirectional speaker with turbine blade-inspired design and deep bass courtesy of the subwoofer embedded inside the Levitation Station. The PJ9 also features Dual Passive Radiator technology to reproduce flush mid-range tones and crisp highs. 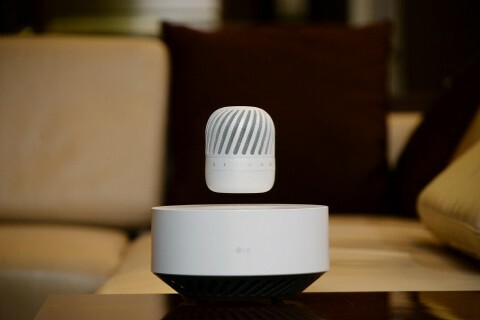 When its 10-hour battery begins to run low, the smart portable speaker automatically descends to the Levitation Station and begins to charge wirelessly with no intervention from the listener and no interruption in the music. The PJ9 is IPX7 compliant in order to withstand any adverse weather condition when being used outdoors. For added convenience and versatility, Multipoint technology enables the speaker to connect to two Bluetooth devices simultaneously. Visitors to CES are encouraged to come to LG’s stand at the Las Vegas Convention Center (Booth #11100, Central Hall) to see the company’s full lineup of wireless audio products. The LG Electronics Home Entertainment Company is a global leader in television, audio video systems, monitors, personal computers, digital signage and commercial displays. The company opened a new era of innovation in the TV market, creating pioneering technologies like OLED TV and implementing an intuitive operating system to allow customers to experience the full benefits of smart TV technology. LG is committed to improving customers’ lives with innovative home entertainment products led by its award-winning 4K OLED TVs, ULTRA HD TVs and webOS TVs. For more information, please visit our website.